Apaf-1 Antibody | 3018 | BioVision, Inc.
100 µg (0.2 mg/ml) immunoaffinity purified, rabbit anti-Apaf-1 polyclonal antibody in phosphate buffered saline (PBS), pH 7.2, containing 30% glycerol, 0.05% BSA, 0.01% thimerosal. Western blotting (0.5-4 µg/ml). However, the optimal conditions should be determined individually. 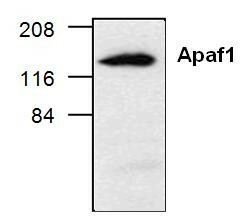 The immunoaffinity purified antibody detects a 130 kDa protein, corresponding to the apparent molecular weight of Apaf-1 on SDS-PAGE immunoblots. During apoptosis, Apaf-1 (apoptosis protease activating factor 1) binds to cytochrome c (Apaf-2), a reaction that requires dATP, and this leads to the formation of a large multimeric complex. The complex recruits pro-caspase-9, and activates caspase-9 (Apaf-3). Activated caspase-9 in turn cleaves and activates caspase-3, one of the proteases responsible for the proteolytic cleavage of many key proteins in apoptosis. Apaf-1 is ubiquitously expressed in human tissues. Siu, M. P. and Alway, S. E. (2005) J. Physiol. 565: 309-323. 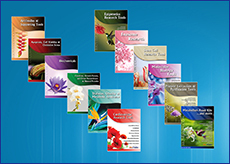 Takatani, T., et al. (2004) Am J Physiol Cell Physiol 10.1152/ajpcell.00042.2004. Dirks, A. and Leeuwenburgh, C. (2002) Am. J. Physiol. 282:519-527. Phaneuf, S. and Leeuwenburgh, C. (2002) Am. J. Physiol. 282:423-430.